Recipe created by master preserver Allison Duffy. This past weekend I bought a box of some really beautiful, local peaches. They were absolutely delicious—so juicy and sweet. But with many more than my family and I could eat, it seemed that jam would be a perfect way to enjoy them. I often use a lot of spices when cooking with peaches. But, since this jam is sweetened with pure maple syrup, I’ve opted to keep things simple and have left out most of the spice so that the maple flavor can really shine through. I’ve included just a touch of vanilla bean, which I think complements the maple nicely. It’s a simple and delicious way to enjoy late summer fruit! Wash, peel, and remove pits from peaches. 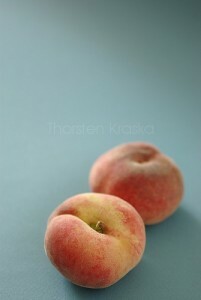 To remove skin, submerge each peach in boiling water for 30-60 seconds, or until the skin splits. Immediately dip the peach in cold water and slip of the skin off. Then, cut the peach as necessary to remove and the pit. Place peeled, pitted peaches in a large bowl and mash. Measure mashed peaches and place in a large pan. Split the vanilla bean lengthwise and carefully scrape out the seeds. Discard the pod (or save for a later use). Sprinkle the vanilla seeds into the peaches and mix well to ensure that the seeds have been dispersed throughout the peaches. Add lemon juice and calcium water to the peaches and mix well. Bring peaches to a boil, then add maple syrup-pectin mixture. Stir vigorously for 1-2 minutes to dissolve the pectin. Return mixture to a boil, then remove from heat. Remove hot jars from canner and fill jars with jam, leaving 1/4 inch of headspace. Remove trapped air bubbles, wipe rims with a damp cloth, and put on lids and screw bands. Turn off heat and allow canner and jars to sit for 5 minutes. Then, remove jars from canner. Allow jars to cool undisturbed for 12-24 hours. Then, confirm that jars have sealed. Enjoy your jam! Or, store properly for later use.